It's no secret, I love cookies!! Elizabeth, unfortunately, has the same gene in her body- the Cookie Monster gene!!!! It's just something we must bear, I suppose. Sigh. To cope? We bake, of course!!! And as much as we enjoy baking, we also enjoy giving them away, too!! Keep a few for yourself and gift a neighbor with a few!! Fun!! 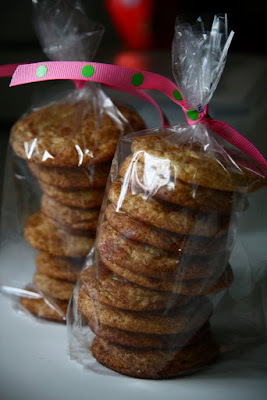 These Snickerdoodles are WONDERFUL!!! Thanks to Smitten Kitchen for providing such an incredible recipe!! They were still crispy the day after we baked!! YUM!!! Those look and sound delicious, I've never tried them before! Well, I will have to try these- I host a neighborhood Christmas Cookie Swap with another gal every year, looks like this recipe might make it on the list! ;) Thanks! These sound so yummy; I love anything with a strong cinnamon flavor. Great idea about giving some away as a gift! I usually just freeze some so we don't eat them all right away. We really don't need the calories... But, I will use this idea next time. Treats for our friends, family, or neighbors. Why didn't I think of this??? Love your blog! Love snickerdoodles! My kids love making them too since they are so easy to make. And we really love snickerdoodles! Definitely one of my favorite cookies to make too! I love these! They were the first cookie I made from scratch as a girl! I have a memory of making them for my high school sweet heart and wrapping them in a box with a bow! I just wanted to say THANK YOU!!!!! I can't remember who sent me the address to your blog but I LOVE it. My family also adopted a boy from China in 2006 who is now 5.... and the love of our lives. I have tried a few of the recipes you posted and all have been GREAT and easy...the latest is the whoopie pie cookies.... coming from the south (or my inlaw family is) they only know them as moon pies.... but they are wonderful... thank you for sharing your life and love of family and home. I'm doing some blog visiting and watching "Andy Griffith" marathon on TVland. Hi! I too am from the south! Your cookies look delish!! !